Hatake Kakashi (Kakashi Hatake in the English anime) is a character in the anime and manga Naruto. The surname "Hatake" means "farmland" and "Kakashi" means "a scarecrow". Kakashi is the Konohagakure Jounin assigned in the beginning of the manga and anime to train and look after Team 7, including Uzumaki Naruto, Uchiha Sasuke, and Haruno Sakura. He is also known as Copy Ninja Kakashi (Kopī Ninja no Kakashi) or Kakashi of the Sharingan (Sharingan no Kakashi). These aliases refer to the fact he copied more than a thousand jutsu (ninja techniques) using his left eye, which possesses the Sharingan, an advanced bloodline trait found only in some members of the nearly defunct Uchiha clan. The three comma-like marks aligned in a wheel in the pupil of his left Sharingan-activated eye indicate that it is fully developed for a normal Sharingan, with only one more level -- Mangekyō Sharingan. However, he is not a real Uchiha, and in fact receives the Sharingan eye from a dying Uchiha Obito, his teammate, during his first mission as a Jōnin. During that mission, Kakashi injured his left eye in a battle trying to protect Obito, leaving behind the scar (which has nothing to do with the transplant operation). The scar comes from a slash that destroyed his original eye. Recently, in chapter 277 of the manga, it was revealed that Kakashi evolved his Sharingan to the Mangekyou...with a twist. His Mangekyou Sharingan can distort time and space...the full extent of its abilities have not been revealed yet. Chronically tardy, Kakashi initially appears to be flaky and unreliable. He is, however, an exceptionally skillful ninja, a child prodigy who attained Chuunin rank at the age of 6 and became a Jounin at age 13. His father was Hatake Sakumo, known as the "White Fang" of Konoha (Konoha no Shiroi Kiba) and a genius ninja on par with the Legendary Sannin (famous students of the Sandaime Hokage : Orochimaru, Jiraiya, and Tsunade). Kakashi Gaiden (sidestory), which began with chapter 239, entitled Gaiden 1: Mission Start...!, introduces the other two members of Kakashi's Genin team, shown in a team portrait in the conclusion of the Chuunin exam arc of the manga. The sensei or teacher in charge of Kakashi's team was the Fourth Hokage, while his teammates were Rin, a girl trained as a medic ninja, and Uchiha Obito, Kakashi's teammate who wears goggles in the team portrait from flashbacks at the conclusion of the Chuunin Exam arc. The gaiden begins on the eve of Kakashi's promotion to Jounin and team leader and the beginning of a mission to the battlefront in the middle of a conflict between Iwagakure (Hidden Rock) and the Konohagakure (Hidden Leaf). Obito, mentioned by Kakashi several times earlier in the series, is revealed to be a member of the Uchiha clan. But, unlike other noteworthy Uchiha including Sasuke and Itachi, Obito initially appears to be like Naruto in behavior, personality and ninja ability, while Kakashi is the acknowledged genius and leader of the group. Obito initially appears without the Sharingan ability. He manages to awaken the Sharingan in battle in chapter 242. The gaiden also explains the origin of the scar on Kakashi's left eye. In the earlier arcs, it was believed that Kakashi's left eye scar came from the surgical implantation of the Sharingan eye. However, in chapter 242 of the Naruto manga, entitled Gaiden Chapter 4: Crybaby Ninja, the scar on Kakashi's left eye appears now to have come from a battle with a Rock ninja. Kakashi detects a Rock ninja, and yells his warning at his teammate, Uchiha Obito, who is too slow to react. Kakashi jumps in front of Obito to save him from the enemy's kunai and thus Kakashi's left eye is slashed to form the scar that Kakashi still has today, blinding him in the left side. In chapter 243, named Present, the mission to rescue Rin from the Rock ninja continues. When Obito throws Kakashi out of the way of a falling rock, caused by a Iwa ninja's Doton: Iwayado Kuzushi (Earth Release: Rock Lodging Destruction), his entire right side is crushed from that falling rock. Mortally wounded, he offers Kakashi his Sharingan-capable, intact left eye as a belated promotion present and final gift to Kakashi. Rin successfully transplants Obito's left eye, replacing Kakashi's useless left eye. Obito's Sharingan eye only has two tomoe, suggesting that Kakashi succeeds in fully evolving the eye to its third stage at a latter time. Following the war, Kakashi earned renowned fame for his use of the Sharingan and developed a reputation for failing every potential Genin team that took the Survival Training Exam he proctored. Like the Sandaime Hokage, and probably Jiraiya and the Fourth Hokage, Kakashi uses the infamous "Bell Test" to test his potential students. Ostensibly a training exercise with Kakashi, the three Academy graduates each have to take a bell from Kakashi, however there are only two bells. The ultimate goal of the Bell Test is to test the potential Genin's teamwork and self sacrifice. This test is what Kakashi uses as the real Genin graduation exam, weeding out potential Genin selected by their passing of the Ninja Academy's graduation exam with a failure rate of more than 66%. While his exam is generally considered to be more exacting and stringent than those of other Jōnin, the Third Hokage believes that his decisions to fail previous teams ultimately proved to be correct and wise. Team 7 became the first Genin team to pass Kakashi's exam. The initial results of the Survival Training Exam for Team 7 were unpromising. Naruto's impulsiveness, Sakura's tunnel vision focus on Sasuke and Sasuke's arrogant superiority and lone-wolf attitude resulted in a lack of teamwork, which led them to fail the Survival Training Exam. Given a second chance, an uncharacteristic display of teamwork impressed Kakashi enough to pass the team, the first Genin team he had ever passed. The team improved their skills under Kakashi's training, which included the tree-walking exercise seen in the anime and manga. This exercise, which involves the use of chakra to walk up trees with feet alone, greatly improved the chakra control abilities of the team as they prepared for a final battle in the Nami no Kuni (Land of Waves) against Momochi Zabuza and his student, Haku. Kakashi's controversial decision to permit Naruto, Sasuke, and Sakura to take the Chūnin exam surprised many, who believed that Kakashi should have given the team another year to prepare. Yet, through this decision, the team begins to truly realize their potential to be ninja. By the end of the second stage, the three exhibit signs of extensive growth from their extreme ordeals. Kakashi, during the tree-walking exercise, is the first one to recognize Naruto's potential to surpass Sasuke and Kakashi in Chakra capacity. Initially considered to be weak and untalented, Naruto's growth as a ninja early in the series is attributed to Kakashi's training and influence. Naruto, in his fight against Inuzuka Kiba, quotes Kakashi's earlier admonition to him: "Use your techniques carefully, after giving some thought to what you're doing! Or it'll be used to the other person's advantage, stupid!" Through the Survival Training Exam, Kakashi recognizes Sakura's faculty with Genjutsu. However, despite the training that Kakashi has given to Naruto and Sakura, the one he has spent the most time in training with is Sasuke. After the second stage of the Chūnin exam until Sasuke's defection to Orochimaru, Kakashi takes an active role in training Sasuke, teaching him Chidori and how to use his Sharingan, as well as attempting to seal the effects of Sasuke's Cursed Seal. Kakashi, like Sasuke, has lost many important people in his life including Obito, whose grave he appears to visit frequently. Sasuke's and Obito's relation, plus Sasuke's Sharingan ability and natural talent, lead Kakashi to train Sasuke for the third portion of the Chūnin exam, much to Naruto's disappointment, believing that Kakashi is playing favorites with Sasuke. Kakashi's intention was for Sasuke to learn to use the Chidori to focus on protecting the important friends he has made in the present, rather than seeking vengeance for the loss of his family. With Akatsuki seeking to capture Naruto, Jiraiya appropriates responsibility for Naruto and his training from Kakashi, while they agree that Sasuke should develop his Sharingan under Kakashi's guidance. Following his recovery after a confrontation with Uchiha Itachi and his Mangekyō Sharingan, Kakashi awakes to find that much has changed. 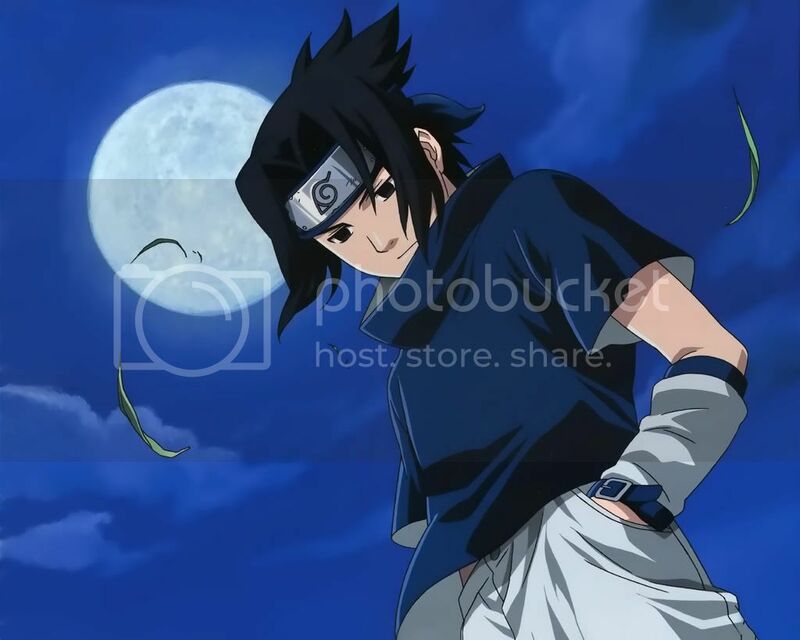 Sasuke's frustration at his inability to kill Itachi and his growing envy of Naruto's recent growth and success leads him to demand a fight against Naruto in order to prove his superiority. The fight quickly gets out of hand and Kakashi is forced to intervene to protect Sakura from accidental harm. Despite Kakashi's admonishment about Chidori and his need to end his quest for revenge, Sasuke's frustration and his need for revenge against Itachi lead him to leave the village and seek Orochimaru and his offer of power. Knowing that Naruto and Sasuke have the potential to kill each other, Kakashi attempts to intervene but arrives too late, finding Naruto seriously injured and Sasuke gone, having succeeded in his defection to Orochimaru. With Kakashi now called on by the village to take more A and S level missions due to the current manpower shortage, Sasuke's defection to Orochimaru, Naruto's three year apprenticeship to Jiraiya, and Sakura's medical apprenticeship to Tsunade, the Fifth Hokage, it seems that Team 7 is currently defunct. Yet, after two and a half years, Naruto and Jiraiya return to the village earlier than expected because of the impatience of Akatsuki at capturing Naruto for his Kyūbi no Yōko (Nine-Tails Fox Demon). Kakashi forms a team with Naruto and Sakura again. However, the relationship between the three is no longer master and students, but equal teammates. Kakashi decides to test Naruto and Sakura's skills with another bell exercise, identical to the one they underwent with Sasuke when they first met Kakashi. The exercise reveals that Naruto and Sakura's skills and abilities had improved over the years. However, Naruto and Sakura manage to finally retrieve the two bells by preying upon Kakashi's addiction to the "Icha Icha" ("Make-out") series of books written by Jiraiya, by trying to spoil the ending of the latest volume, Make-out Tactics, which Naruto gave Kakashi, but hasn't finished yet. In terms of the three main classifications of jutsu: Genjutsu, Ninjutsu, and Taijutsu, Kakashi appears to be balanced in his abilities, as demonstrated in the survival exam. Kakashi is a former member of Anbu (Black Ops in the English version). His signature, and only original, jutsu is the Raikiri (Lightning Blade). Another name for it is Chidori (meaning, "A Thousand Birds"), due to the fact that the sound emitted from the chakra is similar to that of the chirping of a thousand birds. Doing the jutsu, he concentrates chakra into his right hand until it becomes visible. At high speed, this jutsu can cut through anything; thus, it serves as an effective assassination technique. Charging at an opponent, the chakra in his hand grows stronger from body activation, while the sound emitted by the chakra begins to resemble the chirping of a thousand birds. Because the jutsu involves a high speed, linear stab, the Sharingan is needed for the technique to be effective and to avoid enemy countermeasures. Developing Chidori before acquiring his Sharingan eye, he is nearly impaled by an enemy countermeasure, and is injured. As a result, the Fourth Hokage forbids Kakashi to use Chidori again. Kakashi resumes his use of Chidori after receiving the Sharingan eye. Kakashi is believed to have been able to use this jutsu to cut through a lightning bolt, which is why his nickname for the jutsu is Raikiri. There is a distinct difference between Raikiri and Chidori. While Chidori is A-rank (an ultra high level jutsu), Raikiri is S-rank (extreme level jutsu). This is due to Kakashi cutting a lightning bolt with it. Uchiha Sasuke, the only other person able to do this jutsu, is still only at A-rank level, thus he still calls it Chidori. Another famous "jutsu" of his, is the Konohagakure Hiden: Taijutsu no Ōgi: Sennen Goroshi (Hidden Leaf Secret: Taijutsu Supreme Technique: A Thousand Years of Death) (kancho), a verbose title for an extremely sharp, simple poke to the rectal region of an opponent with the index and middle fingers of both hands, launching him into midair with humiliating pain. This is first demonstrated by Kakashi on Naruto during the Survival Training Exam. Naruto "inherits" this jutsu and uses it in modified form later in the series. In addition to the three main types of techniques, Kakashi had been developing faculty with seals. This is seen in Kakashi's ability to restrain the effects of Orochimaru's Cursed Seal on Sasuke with the Fūja Hōin (Evil Sealing Method). Because of Kakashi's current skill level with seals, the seal's power to restrain the Cursed Seal depended on Sasuke's willpower and determination to forsake it and control his emotions. Otherwise, the seal is rendered ineffective. In serious confrontations, however, Kakashi uncovers and uses his Sharingan eye. With the Sharingan, he is able to use its various abilities, which extend beyond its notorious copy ability, as demonstrated in his fight against Zabuza early in the series. Although not a member of the Uchiha clan, we see in chapter 142, entitled Kakashi vs. Itachi, that Kakashi's ability to use the Sharingan is nearly as skillful as Uchiha Itachi, who mastered the normal capabilities of the Sharingan at a very early age. Since Kakashi is not a Uchiha clan member, he should not be able to develop the Mangekyō Sharingan and thus cannot counter it. However, after the time skip, Kakashi is able to use the Mangekyo Sharingan, though his looks different from Itachi's. Also, Kakashi receives more adverse effects from prolonged use of the Sharingan as it drains more chakra energy from him then from an Uchiha. Additionally, he cannot activate or deactivate it at will. The result is Kakashi normally appearing with his forehead protector covering the left eye, to avoid activating the Sharingan in order to conserve chakra. In Part II, Kakashi reveals he has developed a kind of Mangekyo Sharingan, although it looks different from Itachi's Mangekyō Sharingan. With it, he can manipulate space-time, even to a focus, and utilize it to conduct long range attack. In the jutsu's premiere, he managed to destroy Deidara's right arm. Later on, when Deidara's Bunshin attempted to blow himself up and take everyone around with him, he used the Mangekyo Sharingan to banish him out of existence. Kakashi is also a stickler for teamwork, as seen in his design of the survival exam for Team 7. Based on Kakashi Gaiden, Kakashi appears to have been a stickler to ninja rules and regulations, because of his father's suicide over guilt of breaking village rules to save his teammates, which lead to the failure of a vital mission. He seems to have mellowed out a bit, however; apparently with some help from the 4th Hokage and Obito. Kakashi, who has taken these words to heart in the following years, repeats these words to Team 7 after they pass the survival training, becoming the only Genin team to pass survival training with Kakashi as their proctor. Kakashi has an ongoing rivalry with Maito Gai; Kakashi's current record stands at 49 wins, 50 losses. It is later revealed that these battles are diverse in nature, including sprints and Rock, Paper, Scissors. Gai serves as a perfect antithesis for Kakashi in personality, appearance and in technique. Unlike Kakashi, Gai has had to work hard to achieve success as a ninja and mainly uses taijutsu, which is the natural counter to the Sharingan. Another ninja has proven to be a match for Hatake Kakashi: Yakushi Kabuto, Orochimaru's spy, lieutenant and medical ninja, who manages to elude Kakashi in several confrontations. Initially posing as an undistinguished Konoha genin, he proves to be a Jōnin level ninja with skills and abilities on par with Kakashi. His encounter with Uchiha Itachi demonstrated that while Kakashi has one Sharingan eye, he may not be able to match the eyes of a natural Sharingan user. While he could resist the Mangekyō Sharingan, it was the Tsukuyomi technique that ended up not only defeating Kakashi, but rendering him unable to fight for a very long time. Kakashi's personal life appears to be as much of a mystery as the face behind the mask he has worn for most of his ninja career. He has no living family, or at least none he cares to acknowledge (telling Sasuke in chapter 177 that everyone he loves is already dead), though he is immediately recognizable as the son of (or mistaken for) the 'White Fang' of Konoha, Hatake Sakumo. Whether the mask he wears is because of this resemblence or for some other reason is unknown. However, despite Naruto's theories to the contrary, the special chapter "At the Ichiraku Ramen" implies that he is in fact quite handsome. Though he reportedly has many hobbies, the one pastime most seen in the series is his reading of Icha Icha Paradise (Icha Icha Paradaisu, "Make-out Paradise"), the adult, probably pornographic novel authored by Jiraiya that is a runaway best seller in the Naruto mythology. He reads this book when testing Naruto , Sasuke and Sakura. In the first Naruto movie the new daimyo of the Snow country, Fujikaze Yukie, tells team Kakashi that she can be both the Snow Country's monarch and an actress. The fact that she's holding Icha Icha paradise while saying this probably means she'll be playing in an Icha Icha Paradise movie. Later on in the series, Kakashi is reading the second volume of the Icha Icha series, "Icha Icha Violence" ( Icha Icha Baiorensu, "Make-out Violence"). In episode 101, Kakashi sees an advertisement for a movie under that same title. The picture shows a woman kicking a man. With the beginning of Part 2 of the Naruto manga, Kakashi receives the third installment of the Icha Icha series, "Icha Icha Tactics" ( Icha Icha Takutikusu, "Make-out Tactics"), which has yet to be released in the Naruto world. He has also been reading Icha Icha Violence. Otherwise, Kakashi visits Konoha's memorial site, where the dead heroic ninja are remembered. In particular, he visits for Obito's sake. One past manga arc, Kakashi Gaiden, is a side-story, which focuses on Kakashi's past, his relationship with Obito and answers many of the mysteries of Kakashi's life, most notably the origins of his trademark Sharingan eye and Raikiri attack.